In less than a month, there have been two documentaries about two very different but also very similar public figures, one about fashion designer Alexander McQueen, and now one about singer Whitney Houston. Both films were about people who came from unlikely backgrounds to make it big in their respective fields, only to fall victim to their own vices and personality problems, resulting in premature but no less tragic deaths in both cases. They were also packed with archival footage of both figures in action, accompanied by interviews with family and friends who shared their own experiences with the person in question, even revealing new bombshells about their lives that the public hadn’t necessarily heard before. The key difference, however, is in their presentation. McQueen stylised itself like an arthouse film, incorporating the standard documentary traits with abstract imagery and chapter titles, which fit perfectly with the artistic professional lifestyle that Alexander McQueen was best known to live; Whitney, on the other hand, takes on a slightly more pop-ish tone, mixing the interviews and soundbites with clips from Whitney Houston’s highly popular discography, in what is both a celebration of the unique and soulful singer that she was, and also a stern and harrowing look at how her life slowly disintegrated by a lifestyle that was considerably less than healthy. Either way, it’s a powerful piece that’s not to be overlooked. We see Houston’s life play out as clearly as director Kevin Macdonald can conjure from the several interviews and pieces of footage, from her early life as the daughter of singer Cissy Houston, to her meteoritic rise to fame with chart-topper after chart-topper, to her controversial marriage to soul singer Bobby Brown, and of course her highly publicised drug and alcohol addiction which contributed to her death in 2012. Interviewees include several family members of Whitney – known to them as “Nippy” – and personal acquaintances like her assistant Mary Jones, bodyguard Alan Jacobs, and a select few personalities like Kevin Costner – Houston’s co-star in her big movie breakout The Bodyguard – and music mogul Clive Davis, who signed her to his label Arista Records in 1983. They each tell their own versions of life with Whitney Houston, whether it was performing to enormous crowds of people or chilling out behind the scenes. Through their stories, as well as the endless catalogue of footage, we get a glimpse of the sweet and chirpy person that she began her career as, only to see that plummet hard once the drugs start to take hold of her better judgement. Take, for instance, footage that is shown of her performance of arguably her most famous tune “I Will Always Love You” to a crowd in South Africa following the end of apartheid, in which she is graceful, elegant, and about as self-assured as you can imagine. Later on, the movie shows her performing the exact same song during her ill-received final tour in 2009, and the vast difference in her voice, her composure, and her enthusiasm – undeniably due to her continued substance abuse – is very tragic to witness. The movie, made with the blessing of Houston’s family, makes an extremely powerful point of how her fame and private affiliations, most notably her troubling relationship with husband Bobby Brown and their child Bobbi Kristina Brown – who herself very sadly passed in 2015 in an alarmingly similar manner to her mother – were not just the cause of her downfall, but also its instigators, as the pressures of fame and petty jealousy on Brown’s part, not to mention some serious allegations made against a family member when Whitney and her siblings were children, were great enough to lead her down the path she eventually took. In that regard, it is a sobering account of fame and self-destruction that ties itself closer to Asif Kapadia’s Amy than anything else that comes to mind, and is just as chilling and saddening to watch. However, when it highlights Houston’s incredible talent as a singer, and also occasionally an actress, it doesn’t hide how much Whitney Houston, despite her depressing habits, exhibited her passion wherever possible. There’s no doubt that Houston was a magnificent singer, which you can hear for yourself with any one of the catchy singles and albums she left us with, and seeing her perform live was like witnessing a full-blown miracle according to several interviewees who were there, but crucially the film also shows us how passionate she was at that early stage in her career, just happy to be there doing what she absolutely loved to do, and without much in terms of drugs to cloud her mind from better judgement. Even then, as we see some damaging setbacks during her early career, like being briefly ostracised by the black community for her music and voice sounding too white (with even the Reverend Al Sharpton calling for a boycott of “Whitey” Houston as his placards dubbed her), coupled with her being bullied as a child for having lighter skin, it’s not hard to see what would cause her to fatally nosedive into depravity and eventually her tragic passing. However, what’s never lost is the true power of her signature talent, and the film is always quick to position that as the light at the end of the tunnel, making it a documentary that is certainly hard to watch without getting somewhat emotional, but also one that truly celebrates a life that was passionate right towards the very end. 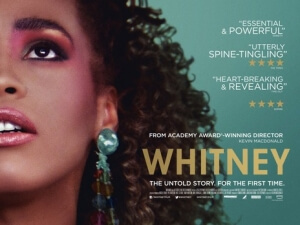 Whitney is a powerful and emotional documentary that shows the rise and tragic fall of iconic singer Whitney Houston, which just about balances the hard-hitting drama behind the scenes with a celebration of her raw talent.